The recent discovery of Roman coins in controlled excavations of a castle in Japan prompted the inevitable question: how did they get there? Could Rome’s fabled trading links have stretched as far as Okinawa? It’s very unlikely. 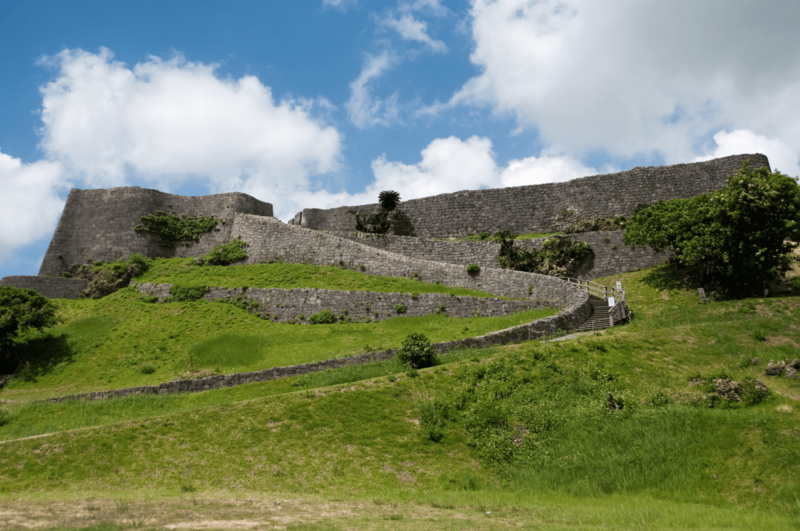 Katsuren Castle in Okinawa Prefecture is said to have been occupied between the 12th to 15th centuries so the coins cannot represent commercial links between the castle’s contemporaries and the Roman empire, which had fallen centuries before. Other finds from the castle indicate trade links with China – so perhaps the coins arrived there as curios, indirectly through trade with China or South-East Asia. So far the only published images of the finds show the obverse (the “heads” side) of the four Roman coins and of an Ottoman copper mangir coin with a clear Hijra date 1099, which corresponds to 1687 to 1688 in the common era. Like the Roman coins, the Ottoman coin poses problems, because it was issued after the presumed abandonment of the castle in the 15th century. The Roman coins are not so easy to identify from the obverses alone. The coin that features most frequently in the news reports appears to be a copper alloy coin of Constantius II (337-361AD), the son of Constantine the Great. The images of the other Roman coins are less clear, but all appear to be of roughly the same date, from about 320-370AD. If images of the reverses (the “tails” sides) of the coins were available it would be possible to date them more closely. However, it is important to note that coins like the one of Constantius II remained in circulation for long after they were issued. In the eastern Roman empire there is evidence that such coins may have continued in use up to the 6th century, some two centuries after they were made. So while it would be useful to be able to date the coins from Katsuren Castle more precisely, they do not necessarily indicate even indirect links between east Asia and Rome in the mid-4th century (although such indirect links are not altogether impossible). There are plenty of Roman coins in southern India and Sri Lanka that are evidence of direct links with the Roman world, and direct trade with these areas is not in doubt. Some recent research indicates the possibility that merchants from the Roman world could have been present in South-East Asia from at least the 2nd century of our era, although the evidence is suggestive rather than concrete – an apparent increase in Roman knowledge of the geography of the region from the 2nd century; and the well-known story of a 2nd-century embassy (perhaps a group of merchants) travelling to China from Vietnam. So could the coins have been transmitted to Japan via South-East Asia? Archaeological evidence from the Isthmus of Kra on the Thai peninsula includes imported materials from Han China and the Roman empire, though these could have arrived indirectly through India. Gold pendants copying Roman gold coins were used in ancient Thailand and Vietnam, and a stone mould for casting such objects has been found in southern Thailand. These may have been inspired by genuine Roman coins and Indian imitations of Roman coins. However, they imitate Roman gold coins of the first and second centuries – and none resembles any of the coins from Katsuren Castle. The only genuine Roman coin known so far from the peninsula is a 3rd–century coin of the Gallo-Roman usurper Victorinus (268-270AD) minted in Cologne in Germany, although another 3rd-century coin was reportedly found in Thailand in the 19th century. Roman coins from the 3rd and 4th centuries have been reported from a site in Cambodia, yet there is an apparent absence of such coins in southern China, suggesting that such coins rarely made it beyond the Gulf of Thailand. A few Roman coins, and imitations of them, have been found in China, where they were probably used as ornaments and as burial goods. Yet these too are usually made of gold – and most are later in date (5th to 7th centuries). The majority are concentrated in northern China, and likely entered along the overland route known as the Silk Road. The fact that the Roman coins found at Katsuren Castle are small, 4th-century copper-alloy coins that were of low value in the Roman world, rather than high value silver or gold, is all the more puzzling. Such coins (and imitations of them) are found in India and Sri Lanka, and at some sites in central Asia, but it is hard to see how they would have travelled on directly from such places to Japan, though indirectly via South-East Asia – and perhaps at a much later date – remains possible. In the end, more detailed study of the other finds from the archaeological contexts in which these coins were found will be necessary to understand how they ended up on the site of a medieval Japanese castle. For the moment it is probably wisest to resist notions of any direct links between Japan and Rome, and to regard them as objects that arrived at a later date. Perhaps the coins are connected in some way to the influence of European traders in Japan in the 16th and 17th centuries – although the Ottoman coin dates to a period after European trade was restricted in Japan. However they arrived there, these coins appear to constitute the furthest-travelled Roman coins before the age of collectors and mass transport.